As opposed to fiction or non-fiction novels, this is more in the vein of a textbook. Write about things you know. No matter how long it takes, keep your eye on the goal of finishing your work. Write every day and keep yourself in the habit of writing. Michael John Fierro has been studying and applying numerology for over twenty five years. A lecturer and frequent guest on local radio stations, Michael speaks on the subject with a passion and zeal that has made him an authority in the genre. Growing up in New Jersey, the middle child of five, Michael’s questions about life developed into an inquisitive mind that sought a deeper understanding of the world in which he lived. His interest in topics of a spiritual and metaphysical nature began in the early 1970’s when he lived in Florida. In 1984, his sister Debra, herself a well known numerologist, introduced him to the science of numerology. Debra gave Michael information, during a reading, that showed a particular incident appearing in his chart through a very specific time period in his life. The situation she spoke of actually took place a few months later, and with that, Michael was certain that numerology had a great deal of validity. The use of numbers in understanding the human condition held great appeal to him, as it augmented his deep interest in mathematics. Throughout the years, Michael has honed his skills and insights through continuous study and work. A natural entrepreneur, Michael was guided in the direction of metaphysics and spirituality where he began his practice as a Numerologist, a path on which he finds himself today. Throughout the various changes in his career, Michael’s creativity and vision have always been his hallmark, and he has often been recognized for his groundbreaking technique and ideas. Over the years, Michael has counseled hundreds through private sessions, and is a favorite lecturer at libraries, bookstores, and other venues. His live radio broadcasts and television appearances featuring on-air readings make him very much in demand as a teacher and practitioner of Numerology. 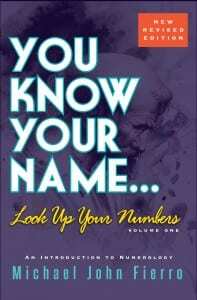 Michael’s well received first publication, 911 for the Soul…411 for the Mind..a collection Of thoughts, wisdom and meditations (currently out of print) is now followed by his exciting and informative latest endeavor, You Know Your Name…Look Up Your Numbers (An Introduction To Numerology). Often Michael will receive a phone call or an email from a client—sometimes months after their reading— to thank him for his insight. It is at these times that he realizes the power of the information that he shares and the profound impact that it has on the people who come to him for counsel. Numerology, like other metaphysical disciplines is just beginning to be a part of our lexicon for spiritual growth, self-awareness and understanding. Michael’s goal is to bring this science to the mainstream in much the way that astrology has been accepted, while maintaining its integrity. Properly used, numerology can be an invaluable tool in the business world, education, and personal development. Local publicity, lectures, and book signings will support the promotion of his new book. Michael currently resides at the Jersey Shore with his Jack Russell Terrier, Shadow. I have been working with Numerology since 1984 and have been able to work with thousands of people in my career. I wanted to share my knowledge with others as I work to introduce Numerology into the mainstream without it losing its integrity.